ROBOTILL can work with the tax setup of any country. To change the tax settings go to Manager > Setup > System Configuration > Sales Tax. You can also choose if the profit displayed in the reports should include tax or not. You can choose a default tax option. This option is the option that will be used by default when you create a new product. 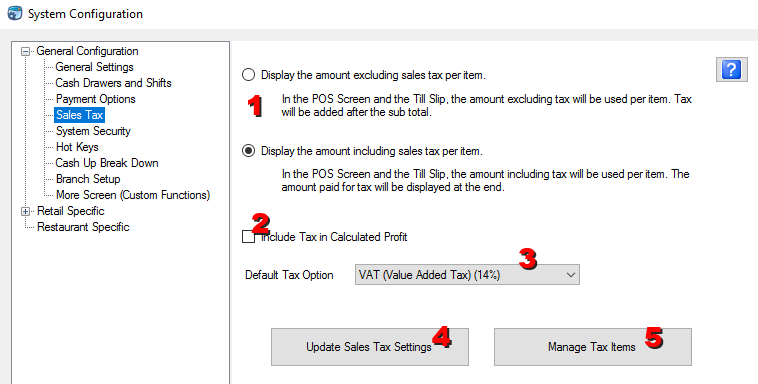 You will still be able to select another tax option if needed in the product setup. Note that on the slip print design you can edit all printed forms to display the tax break down according to your requirements. You can then edit or add a tax item. Add the percentage as a number without the % sign. 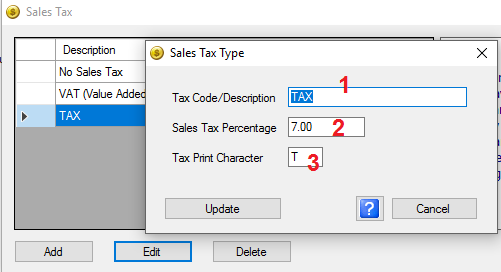 The Tax Print Character is an optional field and can be used to print a tax indicator on the receipts and other till slips (see USA Tax Setup below). A 'tax item' is allocated to a specific product in the product setup. The default tax settings of ROBOTILL is to use VAT and to display the price including tax on receipts and the POS screens. The reason for this is that most countries in the world use VAT. Some countries like the USA don't use VAT and also require that the price excluding tax is used on receipts and other till slips. As items being displayed does not include tax, receipts will also usually indicate on what items tax will be added - usually with a 'T' next to the item on the receipt. These settings can easily be achieved. 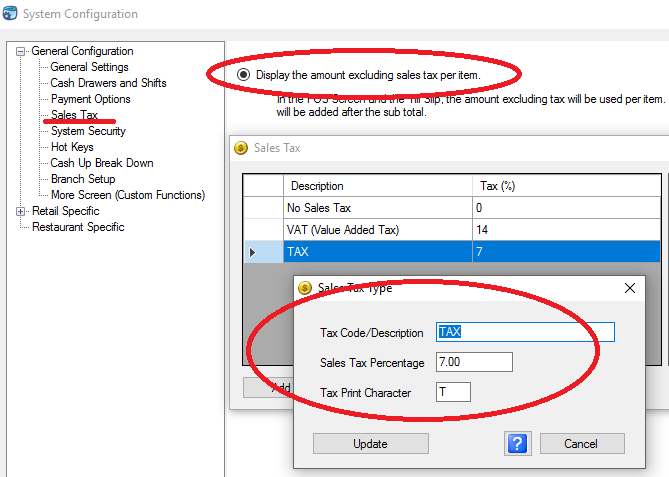 In the Tax Setup select the 'Display the amount excluding sales tax per item' option. Click on 'Manage Tax Items' and add the required tax item. You can add a 'T' as the Tax Print Character to indicate that the item will be taxed. 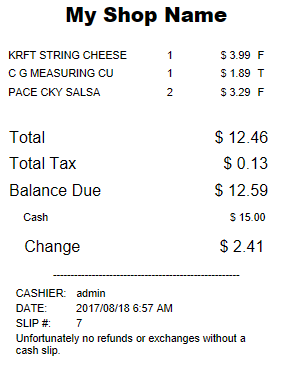 On the 'No Sales Tax' item you can add a 'F' or another indicator to indicate that it is tax free. You then need to change the till slip design to work with your tax requirements. You would probably want to indicate what items will be taxed as the amounts now show the amount excluding tax. Instead of giving a break down of tax after the total (the default) you probably want to show the total excluding tax and then the total tax amount before displaying the total amount to be paid (as shown below). To do this, in the Print Design, edit the required slip(s). Remove the default 'Items and Prices' and 'Tax Detail' (if required) items from the till slip. 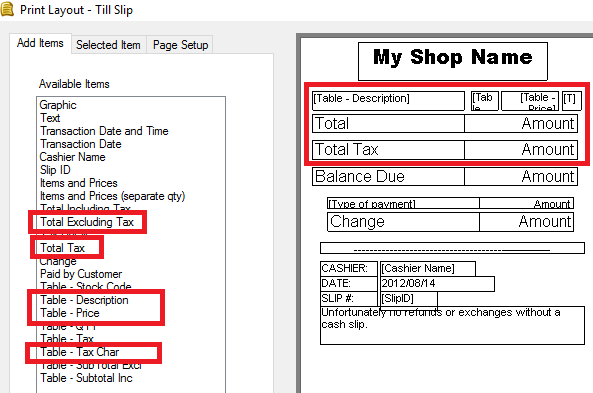 Replace the 'Items and Prices' with table items so that you can add the 'Tax Char' (the tax indicator) on the slip. You can then also add 'Total Tax' and the Total amount excluding tax. See Print Layout and Design for help on print design and table items.